To be in the mood when you read the text and see our photos - why not listening korean music. In DPR Korea you have no pop or rock music - you hear only korean music ! View this site in english We have many satisfied customers from Britain, the United States and other english speaking countries who visited DPR Korea by Korea-Reisedienst. We speak german, english, french and arabic. Please ask for full information in english language. Bien nombreux sont les touristes francophones qui ont pu visiter la Corée du Nord grâce à la compétence, expérience et l`excellent service du «Korea-Reisedienst» votre agence touristique personnelle. Nous parlons allemand, français, anglais et arabe. N`hésitez surtout pas à nous contacter nous nous réjouissons d`avance pour répondre à vos questions. Welcome to the Korea Travel Service website. 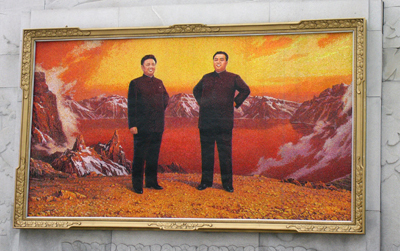 The Democratic People’s Republic of Korea (DPRK) is one of the few remaining blank spaces on international tourism’s map of the world. Visitors find in it a country that looks back with pride on its 5,000 years of history. Its enchanting landscapes, predominantly made up of bizarrely shaped mountains, picturesque valleys and rectangular rice fields, are scattered with artistically interesting and exemplarily restored royal tombs, pagodas and temples. Thanks to the short distances that need to be covered, the high standard of the motorways and the low volume of traffic, the most important sights are easy to get to. Every tour begins and ends in the capital Pyongyang with its monumental architecture, the showcase for modern socialist Korea. As there is no mass tourism, visitors are still received everywhere by friendly people who put enormous effort into making guests from abroad feel welcome. If you have any questions for tours to the DPR Korea please do not hesitate to contact us, we will send you as soon as possible detailed answer and information.